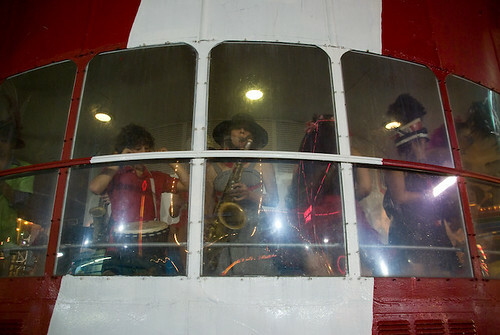 Long Live Coney Island’s Swaying, Singing Astrotower! 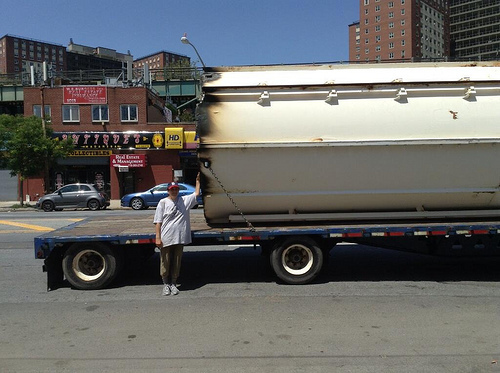 Update July 6, 2013, 9:41PM… RIP Astrotower! The sad and startling four-day, July 4th Holiday Week Demolition of the Astrotower ended this morning with the last sections of the tower being chopped down and hauled off to the scrapyard on Cropsy Avenue. The base has been covered with tarp–it looks like a grave. Coney fans on social media are referring to what’s left of it as the Astrostump or the Lunastump. For those of us who know and love the swaying, singing Astrotower, one of the last survivors of Astroland in Coney Island, yesterday’s news reports that the FDNY had rushed to the scene to monitor the stability of the tower was shocking. The Daily News described the Coney icon as the “Tower of Trepidation,” all because an alarmed tourist, unaware that the tower has always swayed, called 911. The amusement parks had to be closed and evacuated. Late Tuesday night, Luna Park reassured Facebook fans that the Department of Buildings deemed the Astrotower stable. Whew! We hope that means the parks reopen today, the big Fourth of July celebration can go on as scheduled and the tower will finally get some TLC. And maybe a sign that says Swaying Tower of Coney Island? ATZ was skeptical from the get-go that the Astrotower was “unstable.” The tower has always swayed. “It all has to do with the angle of the wind. A very strong flow of wind at the right angle will cause it to sway,” Mark Blumenthal, former operations manager of Astroland told ATZ. “If it’s a high tide, it may help it.” He recalled an incident during Matt Kennedy’s 100th birthday party at Gargiulo’s in 2005 when he had to rush back to Astroland because the tower’s sway had caused police and firetrucks to converge on the scene. A former NYC Department of Buildings inspector was called in to do an engineering report and the tower passed muster. Ever since Luna Park was built on the Astroland site in April 2010, there’d been talk of Zamperla re-purposing the Tower as signage or possibly restoring it as a ride. Since nothing was done, the 270-foot observation tower got rusty and began to look like a neglected step-child amid the glittering new rides on the skyline. Last September, after the Tower was relit for the first time since Astroland closed in 2008, Luna Park confirmed via their Facebook page that it “will provide Coney Island with a spectacular, night-time extravaganza,” but will not be reactivated as a ride. Zamperla removed the gondola –which had given the Astrotower its nickname the “Bagel in the Sky”– and counter weights from the tower in March, after getting a permit to do so last summer. The lighting of the Astrotower with LEDs, similar to what was done with the Parachute Jump, has been planned for next season. This fabulous on-ride video by amusement ride site The DoD3 shows the Astrotower in operation in 2007, which was its last season. According to the Coney Island History Project, the $1.7 million Astrotower was manufactured by the Swiss company Von Roll and installed in 1964. “It required a foundation of 1,100 tons of concrete and 13 tons of steel reinforcing bars. 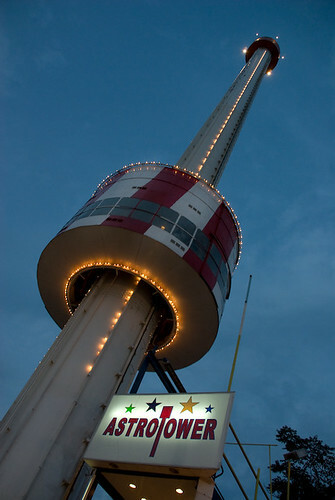 Like Astroland’s other space-age themed rides, the tower was built specifically for the park.” During the rezoning hearings, the Municipal Art Society and Save Coney Island said the structure was eligible for the State and National Registers. Update: July 3, 2013, 5:00PM… At a press conference this afternoon, Luna Park officials announced that the Astrotower would be torn down, according to NY1 News. The more prominent sway of the tower was attributed to the removal of parts of the structure. As ATZ reported, Zamperla removed the gondola –which had given the Astrotower its nickname the “Bagel in the Sky”– and counter weights from the tower in March, after getting a permit to do so last summer. This was obviously a big mistake as anyone who worked for Astroland will tell you the cab, which weighed 10 tons, was always parked mid-tower to stabilize it. 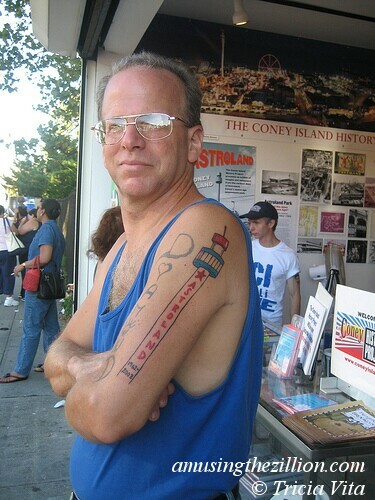 Sources in Coney Island tell ATZ a “compromise plan” has been reached to take off the top of the tower overnight. It will be death by decapitation for the Astrotower (a terrible thing) so that the parks and businesses east of 12th Street, which were closed and evacuated, will be able to open on the Fourth of July (a good thing). Somebody please wake us up from this nightmare. Update: July 4, 2013, 3:11PM… The top of the Astrotower was removed, a more than 12-hour operation that enabled Luna Park, the Cyclone, Deno’s Wonder Wheel Park and concessions in the immediate area to reopen at 3 PM on the 4th of July. That night, the businesses, which would ordinarily stay open till 2AM on Fourth of July were ordered to close at 12:30 AM so that the demolition could continue. Update: July 5, 2013, 8:45PM… Overnight and in the morning, demolition work on the Astrotower continued. By the time work stopped around 1:30PM, the tower had been cut down to 1/3 of its original height, which was 275 feet. The work is expected to continue tonight after the park closes for business. Update: July 7, 2013. All that remains of the tower is the AstroStump also known as the LunaStump. 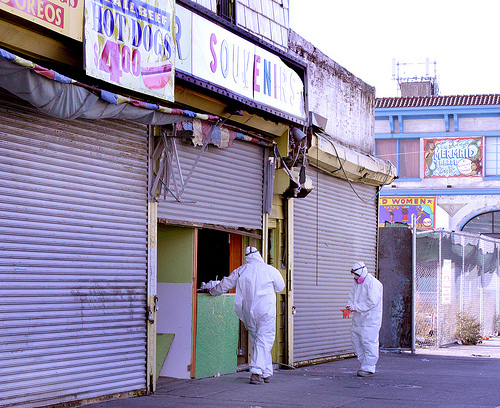 The demolition of Coney Island’s Playland Arcade got underway in October, but was interrupted by Sandy. The job was finished today. It’s gone! Charles Denson of the Coney Island History Project managed to save the remaining letters on the facade– L, N and D– and several of the whimsical yet deteriorating murals. 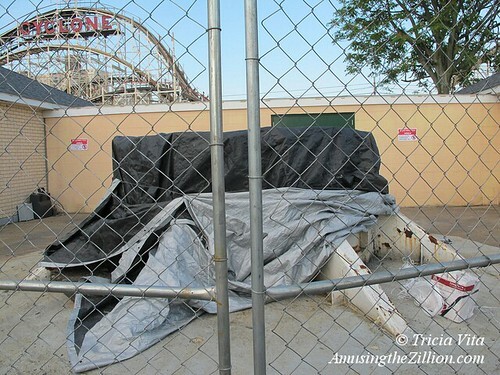 “Our previous efforts at preservation were hampered by trespassers, vandals, black mold, the untimely death of Playland’s caretaker, Andy Badalamenti, as well as Superstorm Sandy,” according to a photo album on the History Project’s Facebook page. The artifacts will be exhibited this season. An arcade existed in the Playland building from the 1930s until 1981, operated by four sets of brothers over a fifty year period. 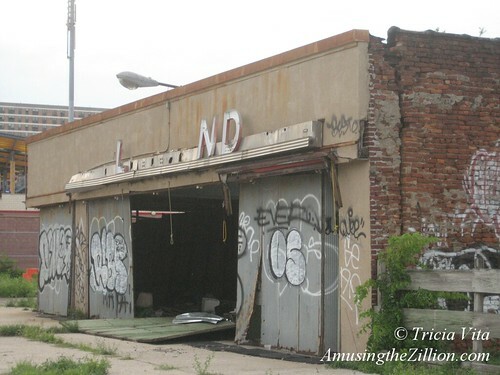 In 1981 the arcade machines were auctioned and the business closed, leaving Playland vacant for the past thirty years. 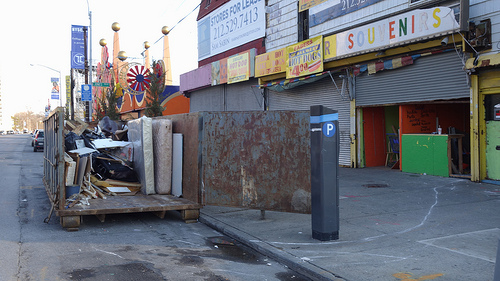 Demolition began today of the long vacant Playland Arcade, which has been closed since 1981. The interior walls were gutted by a demo crew using a small bulldozer. Asbestos removal is slated for Thursday with the exterior walls expected to come down soon afterwards. Owned by Horace Bullard, the Playland building was posted with a City-issued demolition order in September. Bullard is also the owner of the adjacent Thunderbolt lot, which has been vacant since the City tore down the roller coaster in 2000. In recent days, City workers cleared weeds from the lot. Bullard also owns the landmarked Shore Theater, which is for sale for $13.5 million. An arcade operated in the Playland building from the 1930s until 1981, according to Stan Fox, who grew up working in his brother’s penny arcades in Coney Island. He says the arcades were operated by four sets of brothers over a 50-year period: the Silver brothers (Silver’s Penny Arcade), the Katz brothers (Star Penny Arcade), Alex Elowitz and Stan Fox (Playland Arcade), and the Getlan brothers, who kept the Playland name. Alex Elowitz got his start in the arcade business working as a 12-year old change boy for the Silver brothers, says Fox. After a stint in the Army, Alex returned to Coney Island and in 1949 opened his first Playland Arcade on 20th Street and the Boardwalk in the Washington Baths building. Playlands at 15th Street and the Boardwalk and 12th Street and the Boardwalk (where Nathan’s is now) followed. In 1957, Alex and Stan opened their fourth Playland Arcade in the building currently under demolition. They bought the business from the surviving Katz brother for $50,000 and leased the building from Klein and Moran, who also owned the Thunderbolt. “Rent for the whole season was $15,000 in 1957,” says Fox. “In those days 10th Avenue between 42nd and 49th Streets was Coin Machine Row. We ordered a ton of new equipment and renovated the place.” The brothers operated the arcade until 1977, when they sold the business to the Getlan brothers. In 1981 the arcade machines were auctioned and the business closed, leaving Playland vacant for the past thirty years. The demolition of Coney Island’s Playland Arcade, which got underway in October, was interrupted by SuperStorm Sandy. The job was finished today. It’s gone! 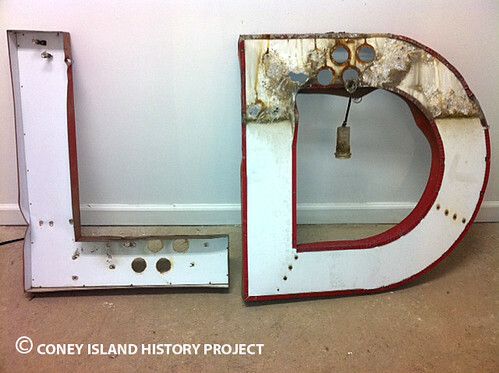 Charles Denson of the Coney Island History Project managed to save the remaining letters on the facade– L, N and D– and several of the murals. An exhibit is scheduled for this summer. This week Thor Equities’ demo crew continued to wreak havoc on historic Surf Avenue. By Thursday afternoon, they had knocked off the top story of Coney Island’s approximately 107-year-old Shore Hotel. Photographer Lindsay Wengler also got some apocalyptic shots of the rubble that once was the Bank of Coney Island and a bulldozer poised to attack on Henderson Walk. War is hell. 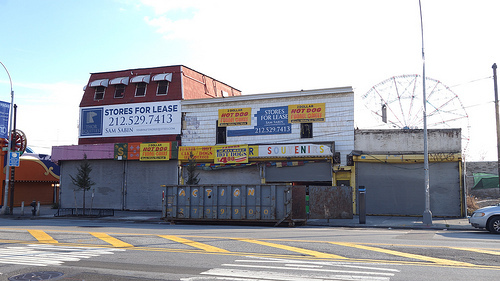 Oh wait, we mean Coney Island redevelopment is hell. For photos and stories of the Shore Hotel in its glory days as well as its seedy days, see Vanishing New York’s post from August 2009. Thor’s ownership destroyed the building. 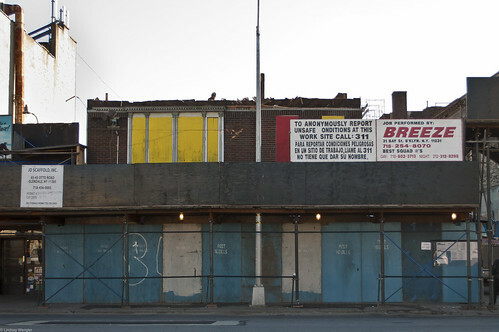 As VNY wrote: “Plywood went into the windows in the summer of 2007, as Thor and the city aimed to blight Coney in preparation for its demolition. When the City’s Plan goes through, a massive high-rise will stand here.” The City’s rezoning of Coney Island, passed by the City Council in 2009, allows four high rise hotels of up to 27 stories along the south side of Surf Avenue. 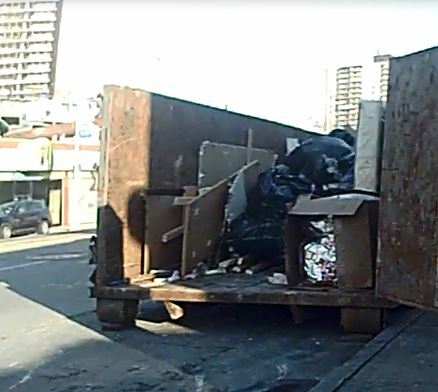 In the other out-with-the-old in Coney news story of the week, this morning’s 10 a.m. court date for the eviction of the “Coney Island Eight” was adjourned till January 10, 2011.